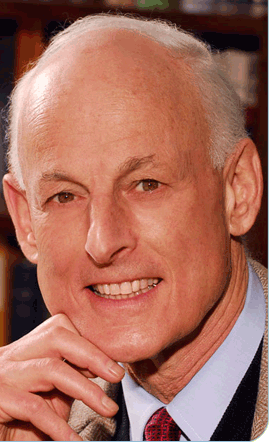 Lehrman has written and lectured widely on American history and economics. He also writes for AbrahamLincoln.org which has created award-winning websites on the 16th President, all linked to: www.AbrahamLincolnsClassroom.org. Lehrman is the author of Lincoln at Peoria: The Turning Point (Stackpole Books, 2008), Churchill, Roosevelt & Company; Studies in Character and Statecraft (Stackpole Books, 2017), Lincoln & Churchill: Statesmen at War (Stackpole Books, 2018), The True Gold Standard (TLI, 2011, 2013), Money, Gold, and History (TLI, 2013), and Lincoln "by littles" (TLI, 2013). He is editor of the second edition of Money and the Coming World Order (TLI, 2012). He has written for publications such as Harper's, the Washington Post, The New York Times, The Wall Street Journal, Greenwich Time, the Harrisburg Patriot-News, the New York Sun, National Review, The Weekly Standard, The American Spectator and Policy Review. Click above to view "People and Ideas"
Mr. Lehrman co-founded the Lincoln & Soldiers Institute at Gettysburg College which annually awards the Lincoln Prize for the best work on the Lincoln era. (It is now the Lincoln Prize at Gettysburg College). There he has taught the Lincoln Senior Seminar. Lewis Lehrman and Richard Gilder established the Gilder Lehrman Center for the Study of Slavery, Resistance and Abolition at Yale University which awards the Frederick Douglass Prize. With Washington College and George Washington's Mount Vernon, they created the George Washington Book Prize. In 1982, Lehrman ran for governor of New York on both the Conservative and Republican Party lines and narrowly lost to Mario Cuomo.